1 C. slivered almonds, blanched or un-blanched (I mostly use the blanched ones); grind them in a grinder( I use my mini-Cuisinart) and then add 1/2 Tsp. cinnamon and 1/4 tsp. ground cloves and grind the nuts with these spices a bit more. 1- 10 or 12 oz. jar jam (NOT JELLY or it will leak like mad) of your choice. If you wish, you can mix in well 1 ½ Tblsp. Brandy in it. Traditionally the torte was made with Lingonberries but you can use your imagination for whatever you wish however makes sure that the filling is of a substantial consistency. I use the Red Raspberry Preserve bought straight from the store. Turbinado Sugar for light dusting before baking. Preheat oven to 375F AFTER your dough has been refrigerated for an hour or more. In a bowl, sift the flour once more with the salt. In a larger bowl, cream the sugar with the butter with electric beaters until the mixture is light and fluffy. (about 3 minutes). Gradually add the dry ingredients (in about 3 divisions for each) to the creamed mixture alternately with the 1 C. ground almonds which has been already mixed with the cinnamon and cloves. Chill the dough in the refrigerator for an hour or more. If it becomes too cold to be pliable when you remove it, leave it out for a bit and keep testing it for the right pliability. Prepare an 8”,9”,or 10” spring-form pan. This will take a bit of time so patience please. First measure the round pan pieces on parchment paper; with a pencil draw its circle and cut it out. Save the left over pieces to fit around the pan sides. Before placing the parchment paper in the pan, brush the bottom and sides with Crisco oil, then place the parchment paper pieces on the oiled bottom and around the oiled sides. Then brush the parchment side and bottom once more with Crisco oil. Then lightly dust some flour on the bottom and shake the pan all over so that the sides get flour dusted as well. Then carefully shake out any residual flour. First, before placing the dough on the bottom of the pan, save a fist full of dough for making the top decorative strips. You’ll probably want about 6-8 strips. (See picture above. )The remainder of the dough place on top of the bottom of your prepared pan. Then with your knuckles, gently spread the dough over the bottom and up the sides about one and a half inch up. Spread the dough with the jam of your preference. I use a rubber spatula to do this. If you have homemade jam, all the better—but no jelly please. Now is the time to roll with your hands several long thin strips to use as a lattice. Intertwine the strips so that it’ll look pretty when served and place each on top of your torte. If the strips break when placing them on top don’t worry—just combine them in any way to make a long strip. Rustic is the theme here. Then, lightly sprinkle it all with Turbinado Sugar which will make the top look a little shinny. Place the torte on a pizza or cookie sheet that has been lined with parchment paper (not aluminum foil because of possible extra heat conducting).This is because your torte may possibly leak. Bake the torte in your preheated 375F oven on the middle rack for 30-45 minutes till it is golden brown on top and the jam is slightly bubbling. I watch it carefully so that it doesn’t get overdone and too brown because then the crust will be tough. Cool the torte thoroughly and then gently run a steel spatula or a sharp knife around the sides to make sure it’ll release properly after unlatching. 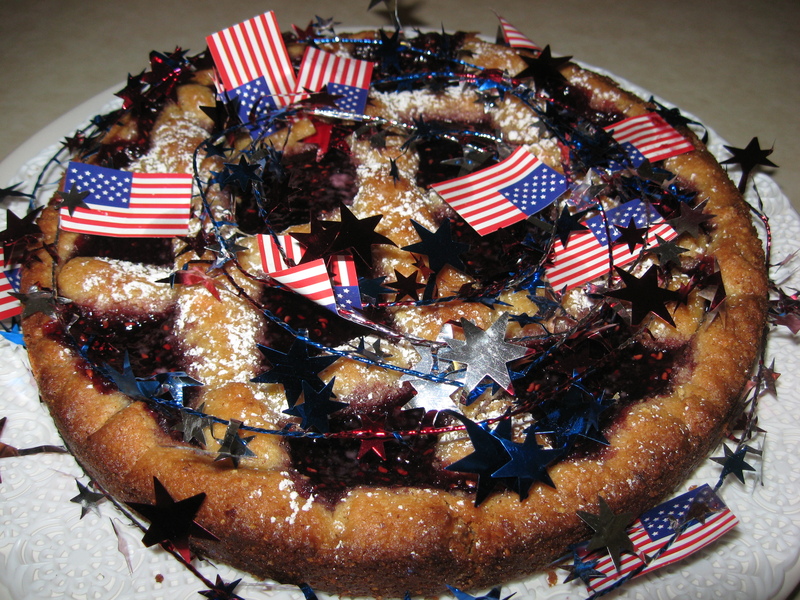 Then place the torte, covered with aluminum foil or saran wrap, in the refrigerator for several hours or even overnight. It must be very cold to release properly. Then unlatch the pan and the torte should release easily. Then you can run a knife under the bottom or just under one tiny side just to make sure that it will lift. At this point, I can usually tip the torte (with the pan’s bottom still on) on its side. It should come apart easily. At this point you can tear off your bottom parchment sheet. Place the torte on whatever dish you wish to use to serve it. I many times use a Chinette plastic plate for the top and bottom which then allows me to wrap it well, store it in the refrigerator for a week or so or wrapped well in the freezer safely without fear of breakage. The torte freezes just beautifully and you’ll be hard pressed to notice it when serving it. 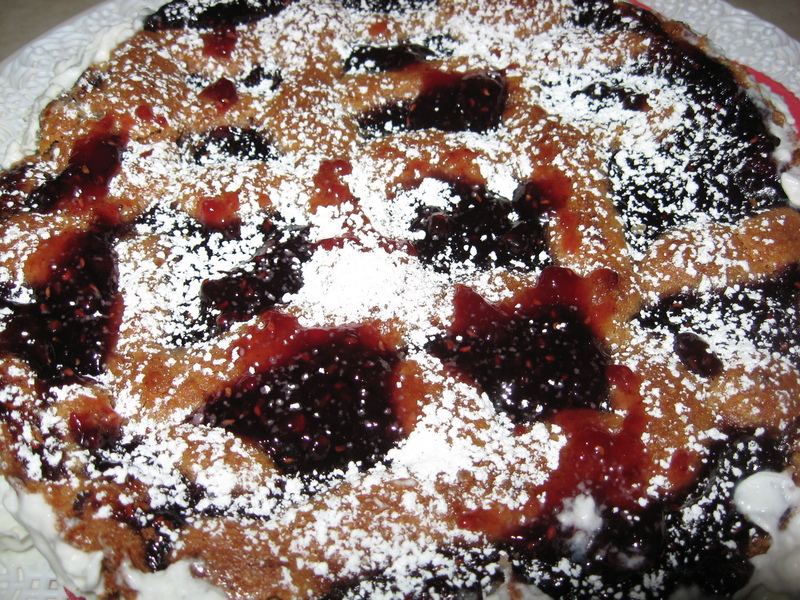 Before last minute serving, if you wish, you can spread a little more jam in the holes and dust it all with powdered sugar. Then you can surround your torte with fresh raspberries which does present a nice look. You can also make mini-cupcake like Linzer Tortes. I use the mini-cupcake paper liners which I brush lightly with the Crisco oil and follow the same directions as for a large one. Bake them in a mini-cup cake pan from anywhere from 12 to 15 minutes in a 375F oven. Watch carefully so they won’t get overdone. Use your middle oven rack. One recipe will make 36 mini-cupcake-like Linzer Tortes. In a medium size bowl, with your electric beaters using the whisk attachment beat the egg whites at a medium-low speed until foamy. Add the lemon juice and beat at medium speed until the whites begin to form soft peaks. Add the sugar one third at a time, then increase the speed to high and beat until stiff peaks form. With a spatula and a small butter knife to help slip the mixture off, pick up some of this mixture and drop onto your parchment covered baking sheet. Let your drops go upwards to form the “kiss” mode (like those chocolate ones). The size can be around 2” circumference rounds. You should be able to place all of the kisses on a 17” X 12” pan. Also, you can place around 4 or 5 across—they don’t spread much. Bake for about 60 to 70 minutes until they are firm to the touch and seem thoroughly dry. Store the “kisses” in an airtight container for up to 2 months.